Though it has been called Arteveldestadion for a decade now, the formal name is to change now. It has been announced that main contractor Ghelamco will be the naming rights holder. When the design was first presented back in 2003, it was nicknamed Arteveldestadion. That name hadn’t changed throughout the design phase and even construction that is now ending. And now comes the announcement of naming change. 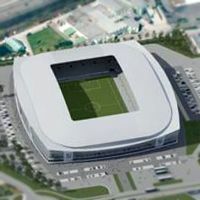 Developer Ghelamco, general contractor for whom this is the first stadium delivered, is expected to seal the deal to rename the new 21,000-seater Ghelamco Arena. Details are not known yet as both sides are still in talks, but the overall agreement is understood to be in place. The stadium is set to open on July 17 for KAA Gent.